L&L Furniture Kit: L&L Add a Furniture Kit To J2927-3 [Add $576.00]Furniture kit for J2918 and J2927 (with either 2-1/2” or 3” brick) includes seven 26” half polygonal shelves, and one square post kit. (A square post kit includes four each of 1/2”, 1”, 2”, 3”, 4”, and 6” high 1-1/2” square posts). (Add 95 lbs to ship weight). Customize these kilns with a wide variety of options. Sectional design and "Pull-Apart" Option make these perfect for sculptural pieces. The L&L JD2927-3 Jupiter Kiln is hot enough to fire stoneware and porcelain. The 18? high J23 and J2918 are only rated to Cone 5 because of the greater percentage of unheated surface area in the kiln (unless you get a powered bottom). Hard, smooth ceramic holders take the worry out of changing your elements in this 3" brick kiln. Look closely at other kilns and see if you want to change elements embedded in the fragile firebrick. You?ll appreciate one of the main features that makes L&L kilns so unique. We use the finest quality 2-1/2? or 3? thick firebrick.The brick is coated with a proprietary reflective ceramic coating which penetrates, binds and hardens the surface of the entire interior of the kiln. This reduces brick dusting. It increases brick life, operating efficiency and uniformity. Some other kiln manufacturers do this on the tops - L&L does it on every brick as the kiln is being made.The shallow cut required by the unique L&L Dyna-Glow element holders makes brick even more energy efficient. See hotkilns.com/brickstudy.pdf for brick energy comparison. All element resistance values are the same in each kiln. No need to carefully match elements when replacing elements. Our multi-zone control on both manual and automatic kilns makes this possible. Elements in the L&L JD2927-3 jupiter kiln are coiled on a special automatic machine that puts the proper spacing in the coil. Evenly spaced elements mean no hot spots and longer element life. Replacement elements need very little stretching. Optional heavy duty elements last longer under high fire and heavy use conditions. Heavy-duty elements use thicker wire and have a lower watt density (watts per square inch of element surface area). The lower the watts density the cooler the elements can run and the longer they last. Elements in the 3" brick kiln are twisted around stainless steel screws mounted on solid ceramic terminal blocks. All contact between elements and wire lugs is over a wide surface of heavily torqued stainless steel washers. Changing elements requires no special tools. The wire from cords is double insulated with special high temperature sleeving to protect it from heat. All Jupiter kilns including manual, automatic, 2-1/2? brick, 3? brick, single phase, three phase and those with powered bottoms are C-UL-us listed. (See page 3). 480 and 380 volt kilns are not listed but are made to National Electrical Code standards. Jupiter kilns are based on the long and well respected Econo-Kiln line that L&L has made for over 40 years.We have simply improved the line. All Jupiter kilns are made of easy to lift 9? high sections which quickly plug into the control panel. Each section has two handles.You can shrink the kiln size or increase it (depending on the control panel) by removing or adding sections. (See hotkilns.com/section.pdf for more information). The standard thermocouples used for the JD Automatic kilns are exposed 8 gauge Type K thermocouples which are fine for low-fire applications. Thermocouples are mounted away from the control panel. They are easy to change. Element connection wire and all terminations are properly calibrated for the thermocouples to keep them accurate. Industrial grade mullite ceramic thermocouple protection tubes are recommended when doing high fires above Cone 1 (around 2000oF).Tested to over 130 Cone 10 firings. (See hotkilns.com/tc-protect.pdf). You can really see! Peepholes in the 3" brick kiln are a full one inch diameter and are not tapered. These large holes allow much greater visibility into the kiln than is found in the tapered holes of most competitors? kilns. A solid cast ceramic insulating plug is included.The plug includes a stepped head on the end to prevent heat loss from the peephole. It is not as fragile as the typical peephole plug used on competitors? kilns. Being straight makes them hard to fall out of the peephole. The Jupiter kiln stand has a full plate of reflective heavy 14 gauge galvannealed steel under the bottom brick. This allows bottom brick to move freely while expanding and contracting. It also provides better support for the kiln so that cracked bottoms will no longer be a problem. Multiple bends in stand tops and legs make stand extremely strong. Legs include protective caps that allow the kiln to be slid over a smooth floor. The VENT-SURE collection box mounts directly to the underside of the stand on four welded studs. The reflective surface under the kiln improves energy efficiency. The new ?Easy-Open, Easy-Load? L&L hinge is counterbalanced with a torsion spring.This lightens the weight of the lid making it easy to open and close. A lighter lid also reduces lid and kiln lip damage. A plunger type safety latch holds the lid in place while it is open. The lid, when open, is tilted away from the kiln opening allowing greater access to the interior. There are no lid supports in the way when loading your kiln. You can safely and easily load from both sides. Anyone who has tried to load a large kiln with a lot of work can fully appreciate this great feature. The hinge extends over three kiln sections and ties the kiln together for stability. This spring-loaded hinge design is standard for the 29? diameter models and optional for the 23? diameter models (add $100). It is not available on the 18? diameter models. All kilns include supplemental safety chains that hook to a wall as a precaution against accidental lid dropping. Kilns create corrosive conditions from heat and fumes. L&L kilns are built to last in this tough environment.The case is stainless steel. Screws are stainless steel. Galvannealed steel stand resists corrosion at high temperatures. Hinge is either powder-coated galvannealed (the springloaded hinge) or stainless steel (the standard hinge). The bottom of this 3" brick kiln can be very easily reversed in case of a firing mishap (except for powered bottoms). Sectional construction makes this possible. The stainless steel case of each kiln section is held together by three adjustable stainless steel clamps. Behind the clamps the stainless steel case is reinforced with a piece of aluminized steel to prevent distortion. The clamps are easily accessible for adjustment.Two clamps are used on lids and bottoms. Some manufacturers rely on the metal band around the kiln to hold the entire weight of the firebrick. L&L screws on several stainless steel clips that hold the firebrick in the band. Bottom elements are available on all models except the J18 and J18X. This improves heat up time and uniformity. It is recommended for heavy loads (such as dense loads of tiles) or where speed of heat up is important. Power is controlled on a separate zone. DaVinci control panels. The sections are not tied together. We provide 45? long cords on all the sections. There is no charge for this option..The kiln sections easily plug into the panel. See photograph of a JD245 (right) for an example. See hotkilns.com/section.pdf. 4-1/2? high unheated sections are available for slightly increasing kiln height without adding power. These can adversely affect heat-up time, maximum temperature and temperature uniformity so we don?t normally recommend them but we do make them available. Vent fumes to outside. Vent collection box mounts on the stand (see photo of stands) for downdraft effect and better uniformity. The vent blower is mounted on the wall rather than under the kiln to improve blower life and environmental safety. L&L kilns are designed from the ground up to be easy to maintain yourself with no special tools. Dyna-Glow element holders and simple industrial grade element terminations make changing elements the easiest of any kiln.The hinged control box is easy to service and, moreover, can be easily detached and sent for expert factory service. Our whole design philosophy is to make a kiln that lasts like the production tool it is. Ask anyone about L&L?s unsurpassed 60 year reputation for service and quality products.We ship most parts from the factory in less than two days. Call us, email us or visit the extensive support section on our web site. See hotkilns.com/warranty.pdf. Every Jupiter kiln is multi-zoned. Each 9? section (and optional powered bottom) has its own separate contactor . In the case of the four or five section automatic kilns the middle sections operate together as one zone. For automatic kilns the optional powered bottom is tied into the bottom zone.However, the DynaTrol allows you to adjust how much of the bottom?s power is used (from 10% to 100%). The control panel is mounted away from kiln heat with air space in between for reliable operation. Control, contactors and sensitive components last longer. The control panel can easily be unplugged by anyone in minutes and sent to the factory service center for quick expert repairs (if ever necessary). The panel door is hinged and all wiring is neatly laid out for easy maintenance. 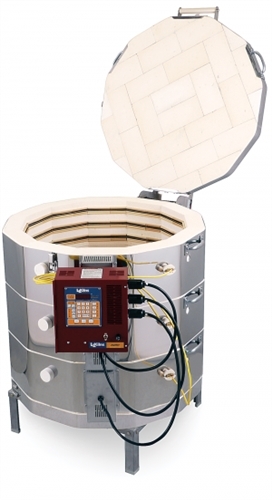 On all automatic Jupiter kilns and all larger manual kilns (all except J18, J18X, J23 and J230 which use zone switches for power switching) power is switched to the elements with sealed power relays.Wiring connections are positive to stable components. All wiring is neatly laid out and tie-wrapped. The instrument panel is well-ventilated. 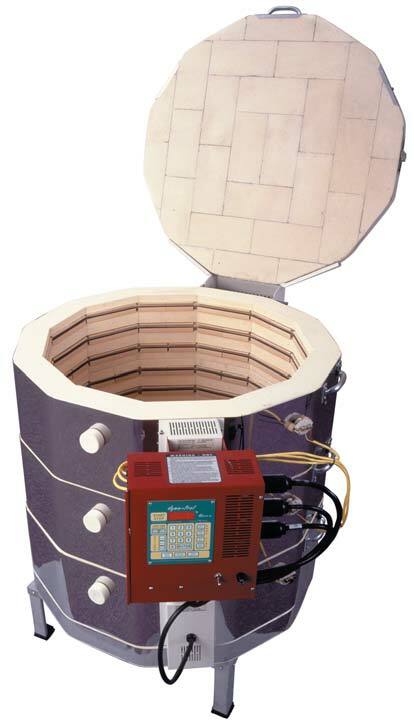 Each element circuit or zone is separately fused on kilns with more than 50 amps. A 50 amp 6-50P six foot power cord is included for J18, J18X, J23, J23PB and J230 single phase models. All other models feature a direct hook-up power terminal block.The NEMA plug configuration we use is shown. The DynaTrol with ?Dynamic Zone Control? replaces manual switches and the Dawson kiln sitter/timer. Operation of the kiln, including zone control for even firing, is completely automated. See hotkilns.com/dynatrol.html. Dynamic Zone Control automatically controls a top, middle and bottom zone for accuracy better than 1/2 cone top to bottom. All our automatic sectional kilns feature this - not just a select few - and you pay no more for this feature. .
An On/Off switch turns power off to the kiln when not using it. A control fuse protects the control circuit. Some automatic kilns don?t have these. Some people have unstable power grids with a lot of electrical noise. This option provides a separate 120 volt cord to supply power to the control circuit.This goes through an EMF noise filter to reduce electromagnetic noise to the control.You can plug this into a computer UPS (Uninterruptible Power Supply) or other computer grade surge protector for further protection. See hotkilns.com/noise.pdf. L&L JD245V-3 Jupiter Kiln - 3" Brick L&L JD236V-3 Jupiter Kiln - 3" Brick L&L JD2936-3 - Jupiter Kiln 3" Brick : 28 x 36" L&L JD18 Jupiter Kiln : 17.5 x 18"
L&L JD18-3 Jupiter Kiln - 3" Brick : 16.5 x18" L&L JD2945-3 Jupiter Kiln - 3" Brick : 28x45" L&L JD245V Jupiter Kiln : 23.5 x 45" L&L JD230V Jupiter Kiln : 23.5 x 27"